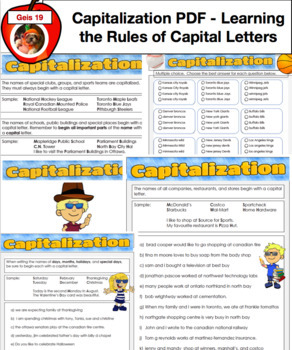 This 26 page PDF file has a number of rules for using capital letters. 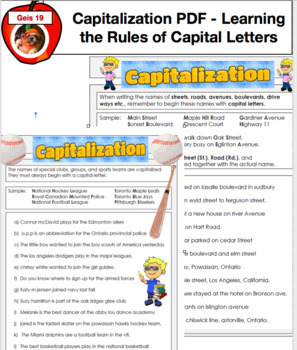 It also includes a number of activities to practice the various rules being studied. An Excellent resource to have in English class. 1.) 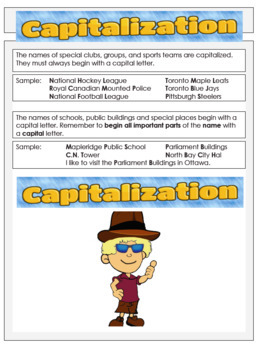 The names of special clubs, groups, and sports teams are capitalized. They must always begin with a capital letter. 2.) The letter "I" is capitalized. 3.) The names of special groups. 4) The names of special clubs, groups, and sports teams. 5.) The names of days of the week, month, holidays, and special days. 6.) The names of schools, public buildings, etc. 7.) The names of villages, towns, and cities. 8.) The names of streets, roads, and avenues, etc. 9) The names of companies, stores, and restaurants. Please Check out the hundreds of teaching resources I have in my store. Just click the link below. If you like my products please click "Follow Me" to stay updated on all new products.